1. Create a new VM as you have done in Step C and run the windows installation again but select Windows 2012 Core (no GUI) this time. 2. Once the installation is done, login with a new password you will create and then shut down the virtual machine. 3. We will use this installation as a Base for our Windows Server Core Installations just as we did in Part E.
4. In Hyper-V Manager right click on that new VM you just created and press Delete. 5. OK remember where you stored the Virtual HD you created for the VM? Great… because it has not been deleted and we will use it to create our Windows Core installation. 4. On the next screen name your drive and select the location. 5. On the next screen specify the parent… the Virtual Hard Drive we created fone Windows 2012 Core Installation in Part F.
7. Name your VM and select the save location. I would use an easy name to idenify the type of server we are going to create using this particular VM. Something like Win2012CoreAD (we are going to use this as our Domain Controller when installing Active Directory). 8. Select 512MB for Memory and select your Virtual Switch in the networking section as you did the when you created your first VM. 9. Now for your Hard Disk, select the Differencing Disk you just created. Click Next and Finish. 10. You can verify your hard disk configuration if you like as you did in Steps 10 and 11 of Part E.
11. You now have a Windows Core VM that runs off of a Base installation of Windows Core. You can create more Differencing disks and create more VMs off of that without having to reinstall Windows Core. This is exactly what we did for the Full Windows Installation. 1. Start up your Windows Core AD server. 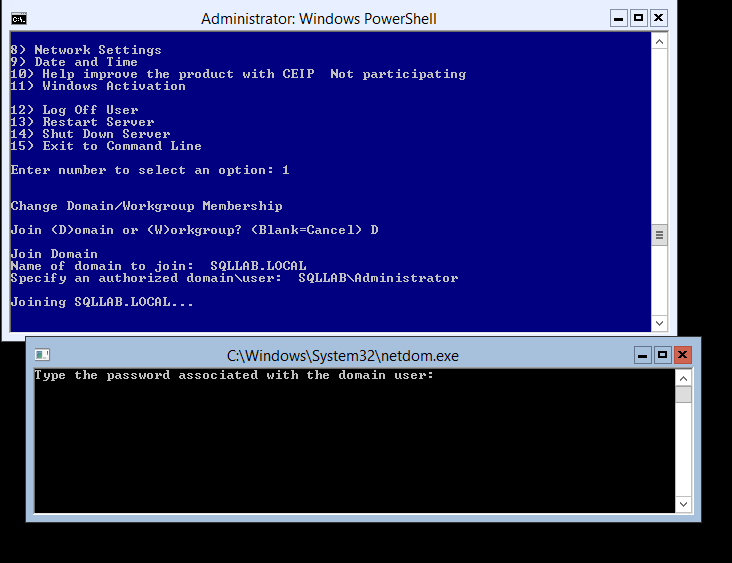 After computer starts, enter your admin password, at command prompt type PowerShell and press enter. 2. Type sconfig and hit enter. Change computer name by pressing 2 on the menu. Restart once the name has changed. My personal preference is change the computer name to the VM name to keep it consistent. 1. After the computer restarts, make sure you are logged in and start PowerShell. Type sconfig and hit enter. 3. Type 1 to Set Network Adapter Address and press enter. Type S for static and hit enter. Change your IP address as desired (make a note of the address you pick). Hit enter and then for the next select (Subnet Mask) just hit enter to take the default and the same for Default Gateway. type 8 and hit enter to go back to Network Settings. You will now see your new settings. Alternate DNS without typing anything. You should see the results of your change. Exit Sconfig by pressing 4 and hitting enter then pressing 15 and hitting enter. 6. Verify the setting from the PowerShell prompt by typing IPConfig /All and pressing enter or just use the PowerShell Command: Get-NetIPAddress. Replace “SQLLAB.LOCAL” with the domain name you want. I used SQLLAB.LOCAL as my domain (yep cheesy but easy). Remember to select a complex password for the SafeModeAdministrationPassword or this portion will fail. 4. You now have a new domain with a new domain controller running on Windows 2012 Core. 1. Start your VM that you installed the full version of Windows 2012 on (SQL2012NodeA in my case). The first thing that should come up when you start your VM is server manager. Minimize this and then go to the Start Menu (just move your mouse down to the lower left corner of the screen). Control Panel should be displayed, if not type out the words, click on the icon. 2. When the control panel comes up, on the right hand there is a drop down labeled “View By” click it and select Large Icons. 3. Click on Network and Sharing Center. On the left side click, Change Adapter Settings. Right click on your Ethernet Adapter and click Properties. On the pop-up click on Internet Protocol Version 4 (TCP/IPv4) and click Properties. 5. Go back to the control panel and find System and open it. Click on Change Settings. On the Computer Name tab click on Change. Another pop should appear. 6. Click Ok and enter your Administrator as the user and Domain Admin Password (the one you made when you created your domain). 7. You should get a Welcome message and a request to restart. Restart and Log into the domain. This might not be obvious from the get go, but after pressing CRTL+ALT+Delete you need to click on the arrow pointing left next to the “picture” and select Other User. This screen shot should help you login properly. Why you ask? Because you need Shared Storage for your cluster. 1. Create a new VM and use the instructions from Part G so that you can use your Base install of Windows 2012 Core. Make sure you give this new VM a good identifying name like WinCoreiSCSI or something. This should allow you to start your new VM right away. 2. Once your new server loads login. You will need to create a new SID for it before you put it on the Domain. At the command prompt issue the following command to create a new SID for your VM. Just leave the defaults on the pop-up and press OK. The computer should restart and ask you you enter a new password, you can use your old password if you like.The reason for this is because no two computers should have the same SID and since you used a base image for your install, you are technically using the same SID. It may take a while, but it saves you space (since you are using the same Hard drive for the Base install) and time (since you don’t have to go through another Windows Installation). 4. Once logged in start PowerShell and then run sconfig. 5. Type 2 and press enter to change the computer name. Give it an easy name to remember (whatever you named your VM should be fine). Allow the computer to restart after that. 7. Once this is done, select option 1 in sconfig. Type D and hit enter at the prompt to join a domain. 8. 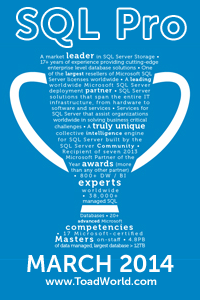 You will be asked to specify the authorized domain\user (SQLLAB\Administrator for example). Type it in and hit enter. Another screen should popup asking for the password, enter it and hit enter. Take note that you cannot see anything being typed so make sure you enter it properly. 9. A new pop-up should appear asking if you want to change the computer name (since we already did there is not need to do this again) Select NO. Select YES when asked to restart. 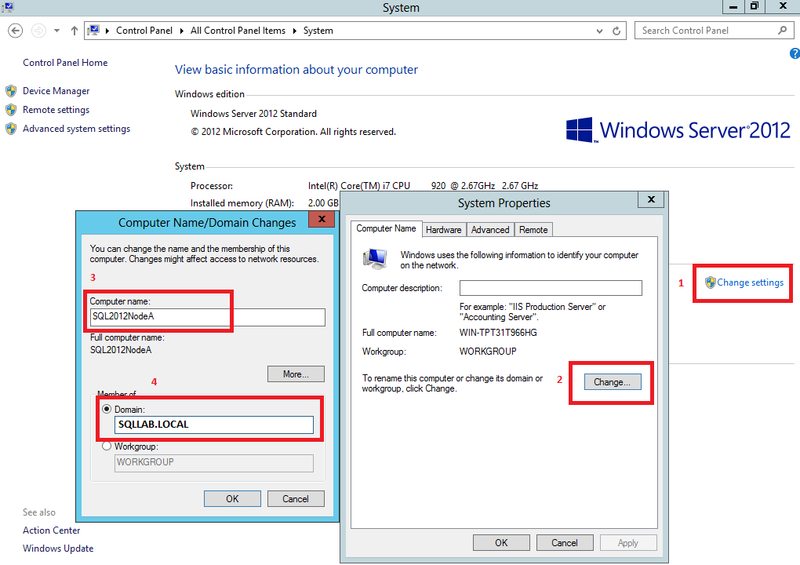 Make sure your Domain Controller was restarted after you created your domain. Additionally, make sure you type the correct password in. Make sure they are on the same Subnet as well. Let me know if you are still having problems and if you could provide some more info about your setup and maybe some screen shots I will try to help out as much as I can. Hmmm that is odd. All of your settings are correct. You did SysPrep to get a new SID for the core machine and then did the IP settings right? SysPrep will wipe out all your other settings. So just double check that you did it in that order. Also, verify that you have the proper networking setup on the Hyper-V level. yes, I did the sysprep,it restarted and asked me to change the password. Can you Ping the AD server from your Core iSCSI Server? 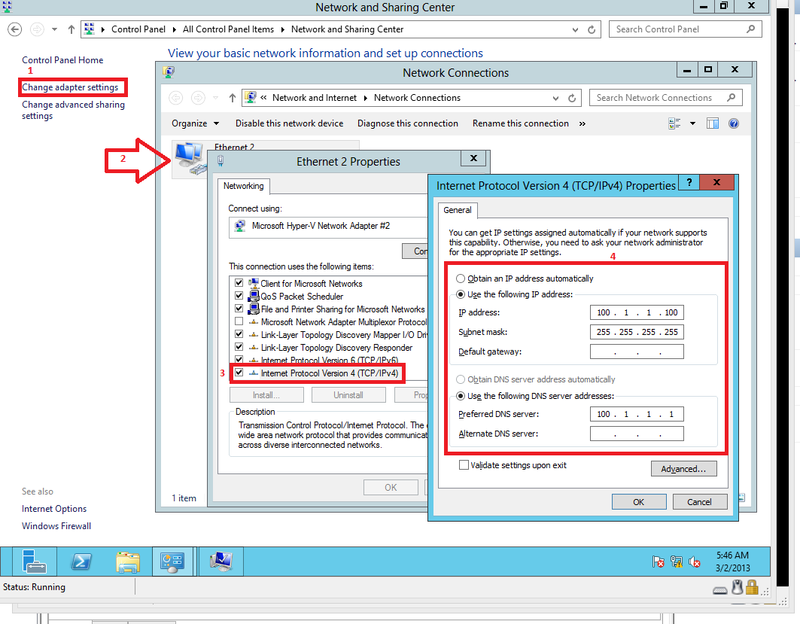 Are you using the same network switch in Hyper-V for both VMs? This is a real odd ball of a problem. I’m out of ideas at the moment but I’ll try to ask some colleagues. Can you provide an error code for the issue? Also make sure you use your domain admin password correctly,it is tricky because nothing shows up when you type it but just give it another shot. network switch is the same. I tried several times and made sure I typed the correct password. I will try to create another VM. it looks like the SID does not change after sysprep. I ran sysprep several times and same result. The error says I need to run sysprep to change the SID. got it to work! I ran the sysprep but this time I checked the checkbox in the popup that follows the sysprep command. Thanks! Is it not checked by default? That’s really strange, I’m going to have to try it out sometime. Glad you got it to work. Good luck with Section 3! Just completed section 3! Thank you for putting this post together. Great work as usual! Thanks. Glad I can be of help. It’s only good if it helps you learn and improve your skills. Outstanding article, very useful.. had the same issue as SS (Fail to join domain), also fixed by checking the option “Generalize” after running sysprep. Thank you very much I’m glad it was useful for you. I put together a video on my YouTube channel about creating SQL VM templates with Hyper-v that you may fins useful if you want a quick stand alone test server. Hi Ayman. First, thanks for this great post. Quick question, i had the same issue with the domain, but I change the option to Audit Mode and also check the “Generalize” box. Once I did that it worked, my question is: do you know what’s the difference between those options?